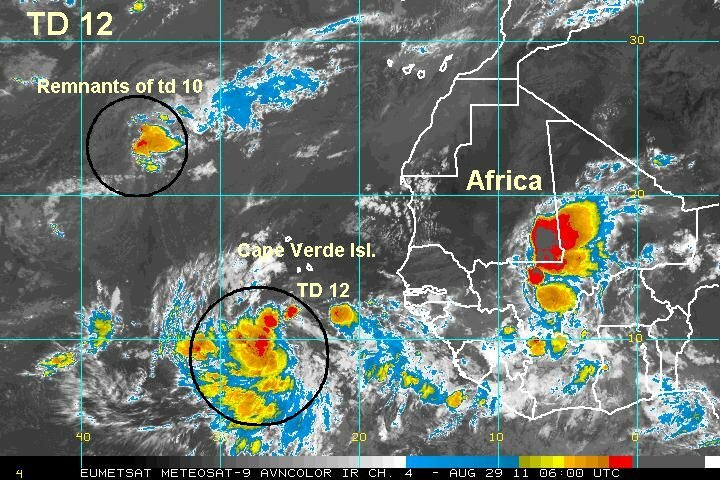 A strong tropical wave south of the Cape Verde Islands has been classified as the 12 Atlantic tropical depression. It will likely become tropical storm Katia within the next 24 hours. At 5 am edt / ast TD 10 was centered at 9.4 N / 26.3 W or about 395 miles ssw of the southern Cape Verde Islands. Top sustained winds 35 mph (NHC 35 mph last advisory). Movement west at 15 mph. Pressure estimated at 1009 mb. Long range forecasts take Katia north of the Leewards and around the Azores - Bermuda high. It's possible that Bermuda and eastern Canada may see some of the effects. It is impossible to tell at this point. Remember that long range forecasts can have large errors. A large area of deep convection is now associated with tropical storm Katia. Easterly wind shear is still keeping the low center on the eastern edge of the cloud mass, but this will likely change soon. Katia is steadily strengthening and will become a hurricane within the next 1-2 days. 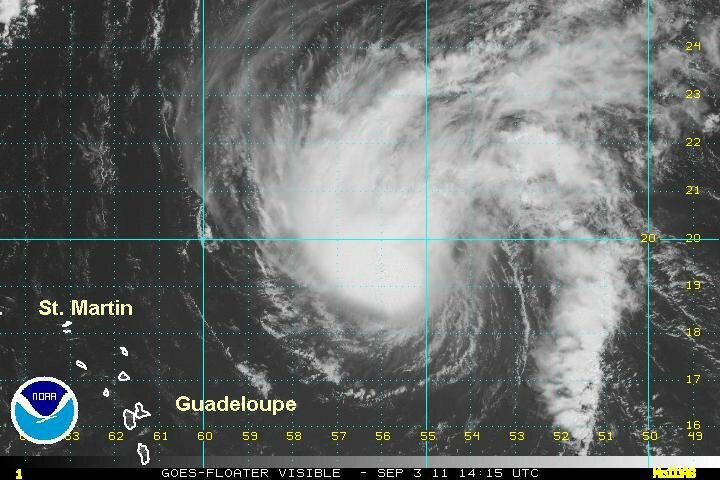 At 5 am edt / ast katia was centered at 11.8 N / 31.7 W or about 535 miles wsw of the southern Cape Verde Islands. Top sustained winds 45 mph (NHC 40 mph last advisory). Movement west at 17 mph. Pressure estimated at 1006 mb. Long range forecasts take Katia north of the Leewards this weekend. It's possible that Bermuda and eastern Canada may see some of the effects sometime next week. Interests in the Leewards and Bermuda should keep an eye on Katia's track. Remember that long range forecasts can have large errors. 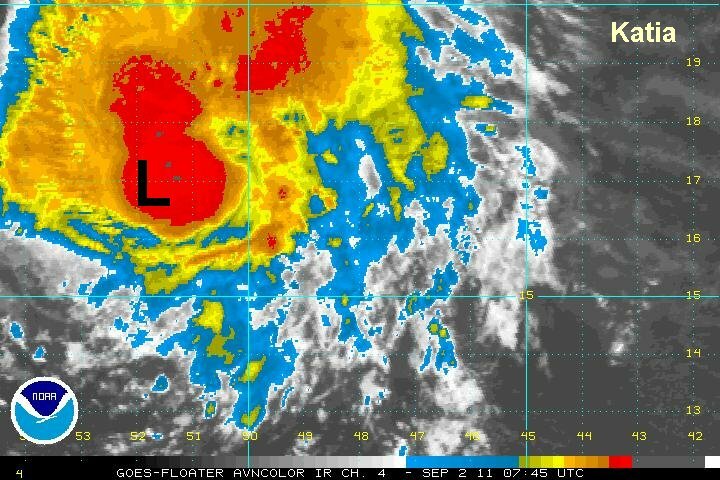 Katia has a ball of convection near the center of circulation and a strong rainband now associated with it. Short term forecasts show a favorable enviroment for development and Katia is expected to become a hurricane in the next 24 hours. Beyond this time frame dry air and wind shear may slow develpment. The models aren't sure about this yet. As for now, the hurricane center is following the "norm" for a hurricane in the deep tropics in the middle of hurricane season by making it a major hurricane as it pulls north of the Leeward Islands. I am not as convinced that Katia is up to 65 mph yet and have a lower estimate than the NHC official strength estimate. At 7 am edt / ast Katia was centered at 13.9 N / 39.3 W or a little over 1000 miles west of the southern Cape Verde Islands / 1500 miles ese of the northeastern Leewards. Top sustained winds 55 mph (NHC 65 mph last advisory). Movement west at 21 mph. Pressure estimated at 994 mb. Long range forecasts take Katia north of the Leewards this weekend. It's possible that Bermuda and eastern Canada may see some of the effects sometime next week. It's still too early to tell for sure, but Bermuda may see effects, even if the center is a few to several hundred miles away. Katia has organized today and is no doubt getting stronger. I believe that it is just below hurricane force, although it wouldn't surprise me if the hurricane center calls it a hurricane at 5 pm. At 4 pm edt / ast Katia was centered at 14.5 N / 41.9 W or about 1350 miles ese of the northeastern Leewards. Top sustained surface winds 70 mph (NHC 65 mph last advisory). Movement wnw at 21 mph. Pressure estimated at 994 mb. Long range forecasts take Katia north of the Leewards this weekend. It's possible that Bermuda and eastern Canada may see some of the effects sometime next week. Forecast models take Katia in the general area around Bermuda around Wednesday / Thursday and possibly near eastern Canada by the following Friday / Saturday (9-10 days from now). Katia became a hurricane last night. It appears that the methodical strengthening has stopped for now. No additional organization has occured over the past 6-12 hours. Katia is still expected to go through significant strengthening and become a major hurricane in a few days. Depending on how large Katia eventually becomes, some rainbands may affect the Leewards later Saturday into Sunday. Swell will increase in the Lesser Antilles over the next few days with east and north facing beaches getting the higher swell. At 7 am edt / ast Katia was centered at 15.3 N / 46.1 W or a little over 1000 miles ese of the northeastern Leewards. Top sustained surface winds 75 mph (NHC 75 mph last advisory). Movement west at 20 mph. Pressure estimated at 987 mb. Long range forecasts take Katia north of the Leewards this weekend. It's possible that Bermuda and eastern Canada may see some of the effects sometime next week. Forecast models take Katia in the general area around Bermuda around Wednesday / Thursday and possibly near enough to eastern Canada by the following Friday / Saturday (9-10 days from now) to see some effects. Katia has been sheared today. This is good and bad news. Good- shearing has weakened the circulation and is allowing winds to drop some. Bad - The shearing will allow it to be controlled more by the low level wind flow...possibly taking Katia farther west than models indicate. It all depends on how long the shearing lasts. This will be critical to watch! Also, it's possible that the hurricane center will not drop the winds for the sake of continuity and keep it as a hurricane. At 1 pm edt / ast Katia was centered at 15.6 N / 48.5 W or about 925 miles ese of the northeastern Leewards. Top sustained surface winds 65 mph (NHC 75 mph last advisory). Movement west at 18 mph. Pressure estimated at 987 mb. Keep in mind that my distance calculation is a little different from NHC's because of measuring from a different point in the Leewards. 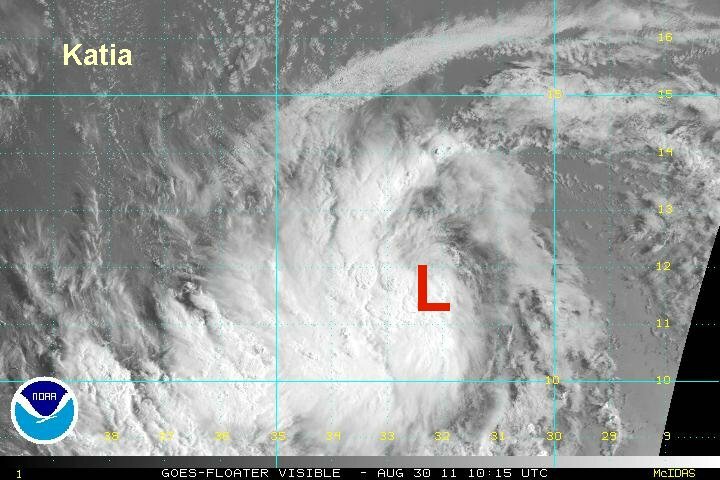 It looks like Katia is a hurricane again, despite still fighting southwesterly wind shear. The main story is a very disconcerting change in the forecast models. The details are below. At 9 pm edt / ast Katia was centered at 16.4 N / 49.7 W or about 870 miles ese of the northeastern Leewards. Top sustained surface winds 75 mph (NHC 70 mph last advisory). Movement west at 18 mph. Pressure estimated at 990 mb. Long range forecasts are starting to split. The upper air trough expected to turn Katia northward several days from now is not as strong on some models. Overall the general trend is farther west. One forecast now takes Katia west of Bermuda and turns it a several hundred miles east of the U.S. coast. Another model has Katia missing the upper trough. This is a very bad scenario if this forecast were to verify. In this case katia would continue west... toward the U.S. coast. Interests in the Leewards, the Bahamas, U.S. east coast and Bermuda should keep an eye on Katia's track. Remember that long range forecasts can have large errors. 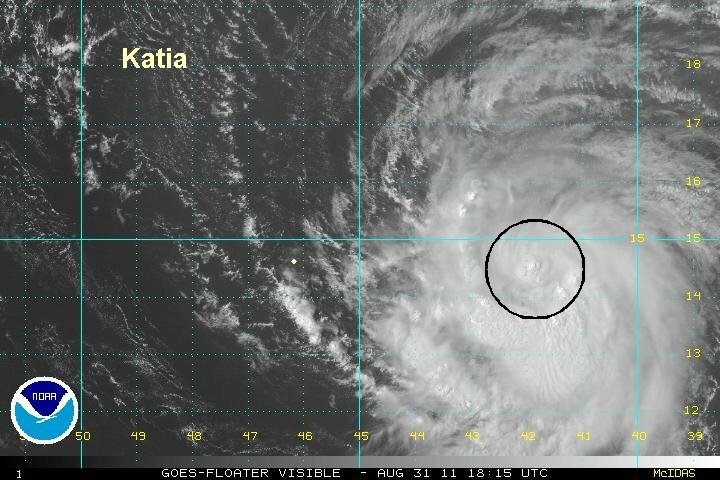 Katia is still fighting southwestly winds from aloft slowing the strengthening. The windshear is expected to weaken but we're not sure exactly when that will occur since the models differ some. I still have estimated winds a little higher than the hurricane center. Depending on how large Katia eventually becomes, some rainbands may affect the Leewards later Saturday into Sunday. Swell will increase in the Lesser Antilles over the next few days with east and north facing beaches getting the higher swell. The Bahamas, Bermuda and the U.S. east coast will also see swell increase in the days ahead. At 5 am edt / ast Katia was centered at 17.0 N / 51.8 W or about 750 miles east of the northeastern Leewards. Top sustained surface winds 75 mph (NHC 70 mph last advisory). Movement wnw at 15 mph. Pressure estimated at 994 mb. Long range forecasts continue to be split. The upper air trough expected to turn Katia northward several days from now is not as strong on some models. Overall the general trend is farther west. One forecast now takes Katia west of Bermuda and turns it several hundred miles east of the U.S. coast. Another model has Katia missing the upper trough. This is a very bad scenario if this forecast were to verify. In this case katia would continue west... toward the U.S. coast. The hurricane center has now also started to adjust their long range track farther west. Interests in the Leewards, the Bahamas, U.S. east coast, and Bermuda should keep an eye on Katia's track. Remember that long range forecasts can have large errors. The hurricane center upgraded Katia back to hurricane strength a few hours ago. Overall, the southerly wind shear continues and Katia doesn't appear to have changed much in organization today. The last couple of visible satellite images may possibly show that the shear is weakening and allowing for strengthening to begin. Some of the outer rainbands may affect the Leewards this weekend as Katia passes well to the north of the Islands. Swell will increase in the Lesser Antilles over this weekend with east and north facing beaches getting the higher swell. The Bahamas, Bermuda and the U.S. east coast will also see swell increase in the days ahead. 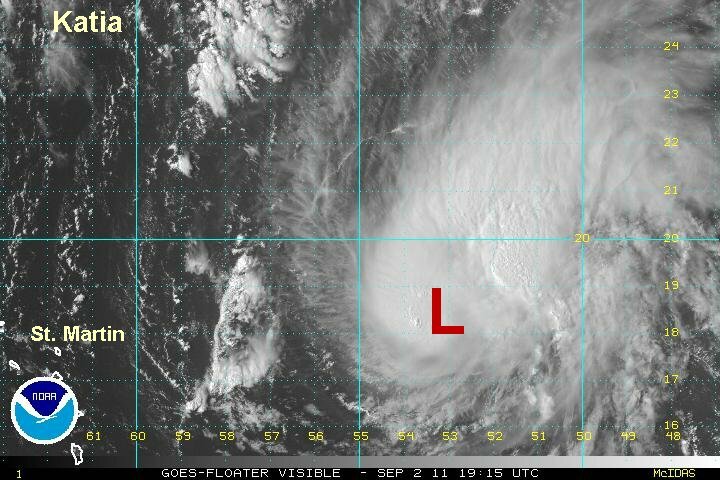 At 5 pm edt / ast Katia was centered at 18.4 N / 53.5 W or about 630 miles east of the northern Leewards. Top sustained surface winds 75 mph (NHC 75 mph last advisory). Movement wnw at 12 mph. Pressure estimated at 989 mb. The long range forecasts remain divided. 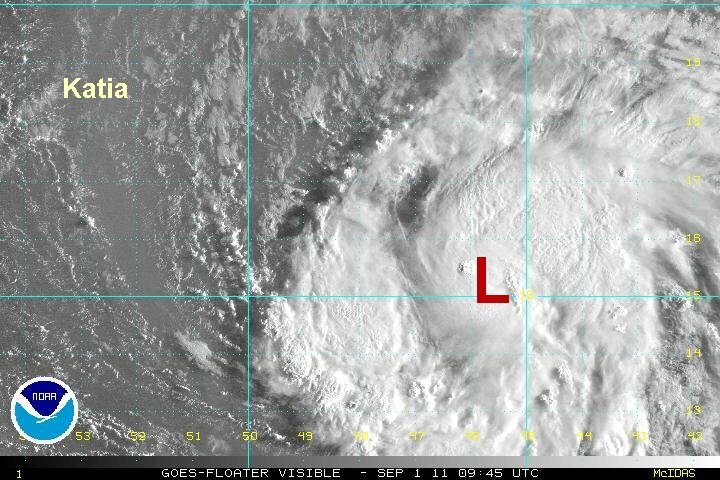 It does appear that Katia will be west of Bermuda now with some effects still possible. One forecast takes Katia west of Bermuda and turns it a few hundred miles east of the U.S. coast of North Carolina and Cape Cod. Another model has Katia missing the upper trough. This is a very bad scenario if this forecast were to verify. In this case katia would continue west... toward the U.S. coast. The hurricane center has now also started to adjust their long range track farther west. Katia continues unchanged in overall organization this morning. It is still fighting wind shear from the southwest. Some strengthening is still expected when the wind shear decreases in a day or two. Forecast models are becoming more inline and are detailed below. Some of the outer rainbands may affect the Leewards Sunday into Monday as Katia passes well to the north of the Islands. Swell will increase in the Lesser Antilles over this weekend with east and north facing beaches getting the higher swell. The Bahamas, Bermuda and the U.S. east coast will also see swell increase in the days ahead. 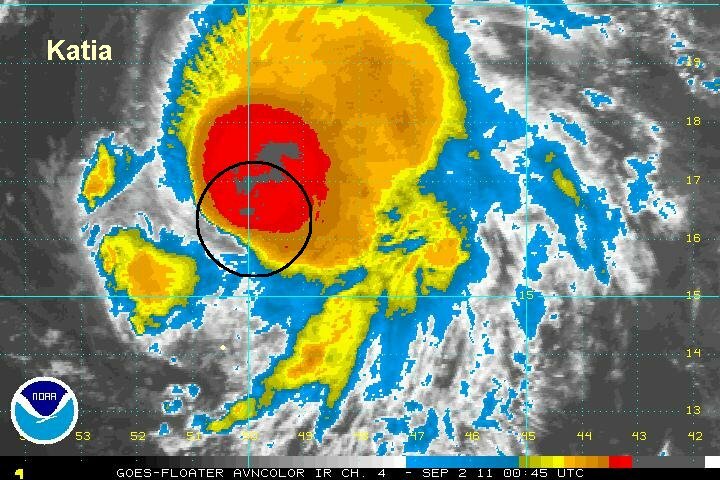 At 9 am edt / ast Katia was centered at 19.4 N / 55.4 W or about 520 miles ene of St. Martin. Top sustained surface winds 75 mph (NHC 75 mph last advisory). Movement nw at 10 mph. Pressure estimated at 988 mb. The long range forecasts are finally coming together. They take Katia nw and recurve well east of the Bahamas. It appears that an upper air trough will take it northward about 100-200 miles east of the U.S. east coast of North Carolina and Cape Cod....well west of Bermuda. Interests in the Leewards, the Bahamas, U.S. east coast from North Carolina northward, and Bermuda should keep an eye on Katia's track. Remember that long range forecasts can have large errors. 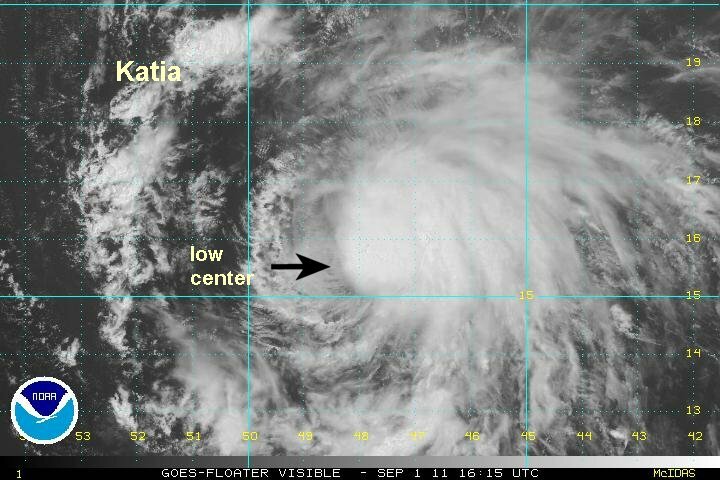 Katia continues northwest fighting upper air wind shear. It continues as a minimal hurricane and is not affecting land at this time. Some of the outer rainbands may affect the Leewards Sunday into Monday as Katia passes well to the north of the Islands. Swell will increase in the Leewards wiith east and north facing beaches getting the higher swell. The Bahamas, Bermuda and the U.S. east coast will also see swell increase in the days ahead. At 11 am edt / ast Katia was centered at 19.6 N / 55.8 W or about 485 miles ene of St. Martin. Top sustained surface winds 75 mph (NHC 75 mph last advisory). Movement nw at 10 mph. Pressure estimated at 989 mb. The long range forecasts are finally coming together. They take Katia nw and recurve well east of the Bahamas. It appears that an upper air trough will take it northward several hundred miles east of North Carolina and a few hundred miles east of Cape Cod ...well west of Bermuda. It's possible that Katia will affect eastern Canada. The hurricane center downgraded Katia to a tropical storm this advisory. Katia may have been a tropical storm over the past 12 hours, but now appears to be strengthening some. Because of this I am keeping winds at 75 mph. A deep burst of convection covers the center of circulation and Katia looks better organized than at any other time so far. At 5 pm edt / ast Katia was centered at 19.9 N / 56.8 W or about 430 miles ene of St. Martin. Top sustained surface winds 75 mph (NHC 75 mph last advisory). Movement wnw at 10 mph. Pressure estimated at 993 mb. IR satellite imagery shows that the shear is decreasing with a burst of convection near the center of the low. 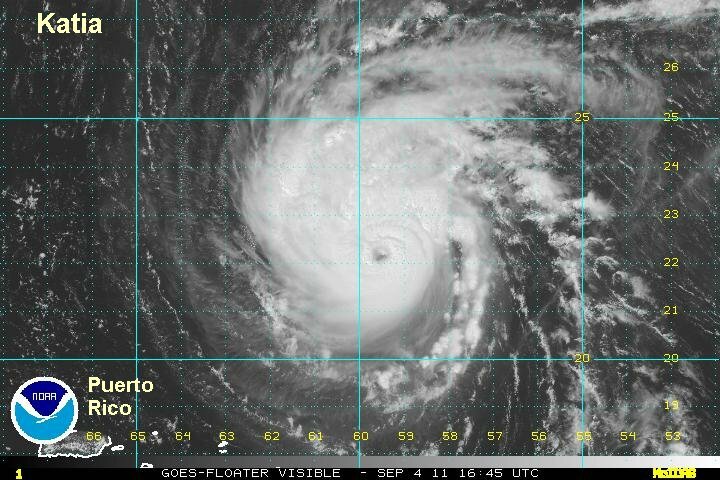 Katia looks to be a little stronger and is probably 75-80 mph now. 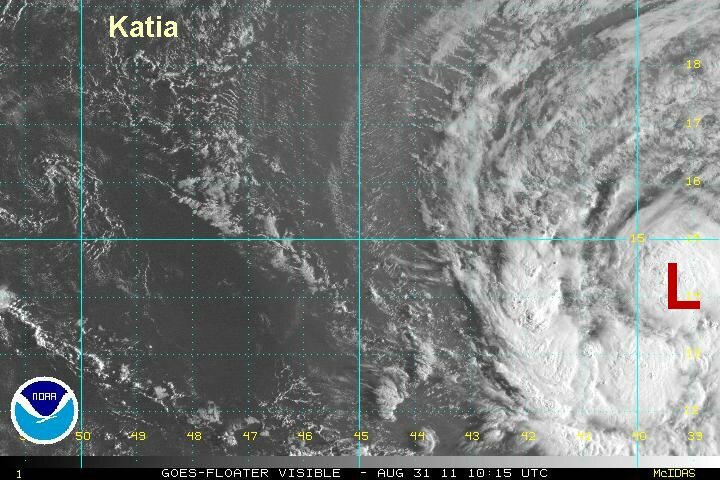 NHC will likely make Katia a hurricane again this evening. the next full update will be sunday morning. Satellite imagery continues to show that the shearing has lessened over katia. Clouds top have stayed relatively warm which suggests little strengthening. As of the last adisory, the hurricane center has Katia just below hurricane strength. 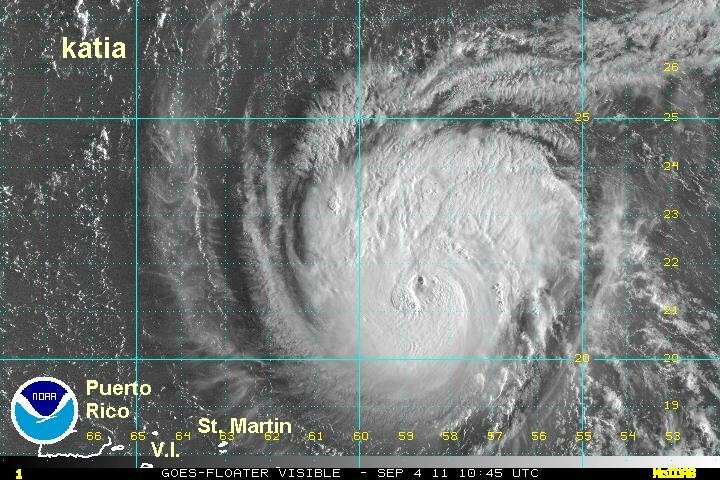 I still believe that Katia is a minimal hurricane due to the fact that an eye is just staring to form. It appears that higher than normal swell and a few showers are all the the Leewards Islands will see of Katia. Rainbands have not formed south of the circulation. Recent models have trended farther west again and are outlined below. 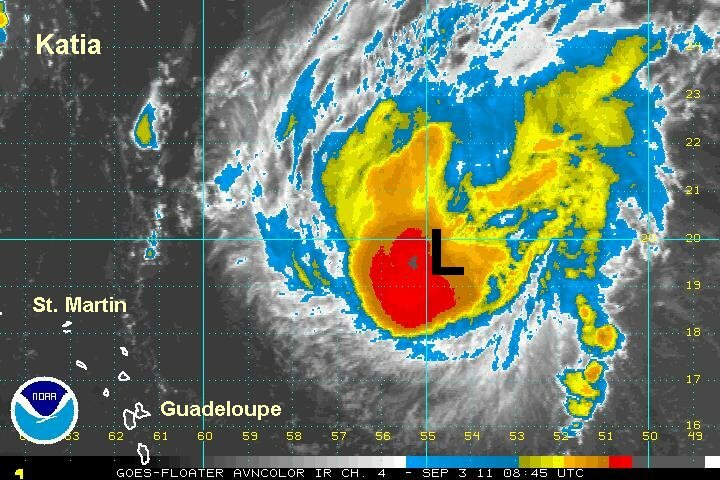 At 7 am edt / ast Katia was centered at 21.4 N / 58.5 W or about 350 miles ne of St. Martin. Top sustained surface winds 80 mph (NHC 70 mph last advisory). Movement wnw at 12 mph. Pressure estimated at 992 mb. The long range forecasts have waffled some again. One model is building the ridge stronger to allow Katia to come close to the North Carolina coast by later this week, possibly around Friday. The other models still take Katia a few hundred miles to the east of North Carolina. Interests on the U.S. east coast from South Carolina northward and eastern Canada should keep an eye on Katia's track. Remember that long range forecasts can have large errors. NHC quickly upped their winds when Katia crossed over a buoy this morning. My suspicion that Katia was a hurricane was realized. When a gust to 107 mph and 33 foot seas were measure late this morning. The eye is now well formed and cloud tops are cooling. Because of this I think katia is now a major hurricane. 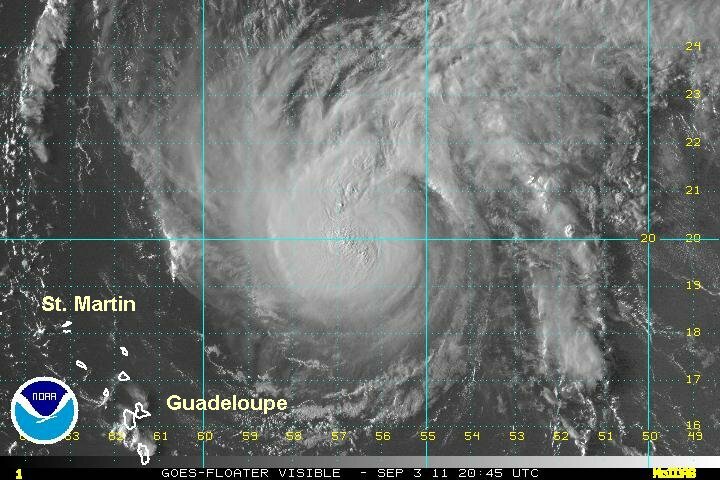 At 2 pm edt / ast Katia was centered at 22.4 N / 59.8 W or about 335 miles ne of St. Martin. Top sustained surface winds 115 mph (NHC 100 mph last advisory). Movement nw at 12 mph. Pressure estimated at 960 mb. The forecast shows Katia strengthening and moving in the general direction of the Mid-Atlantic coast east of North Carolina. models recurve it to the north roughly a couple of hundred miles east of Cape Hatteras.